The Shag Shack II is a 14 x 60 houseboat that has all the comforts of home. When you board the boat you step onto a large front deck that has a patio table and seating for seven along with a ceiling fan to keep you cool. Inside you will find a double bed pull out sleeper sofa. The salon features a large flat screen tv with satellite service and a DVD player along with a dining table that seats four. The kitchen is fully equipped with a stove, microwave/convection oven and full size refrigerator with an ice make. It has ample cabinet space and all the pots, pans, dishes, glasses and silverware you would need. The hall bed room has a full size bed with a twin above. The master state room has a queen size bed, space for hanging clothes ample drawer space. it also has a flatscreen tv with a built in DVD player and a washer dryer for your convenience. The bathroom has a toilet, shower and a lavatory, a hair dryer is stored under the counter. The top of the boat is a place everyone loves to be for sunning and star gazing, the view is fantastic from the upper deck! The back of the boat has a large rear deck and is equipped with a gas grill for your pleasure. A Boat Ramp is located next to the dock. You are welcome to Dock your boat on the back of the Shag Shack for easy boarding and lake access. The use of the boat is for accommodations only, the boat is not for hire or use away from the dock. My wife and I have lived in Camden all of our lives. We have two children and four grandchildren. In our spare time we love being out on the water spending time with family and friends. 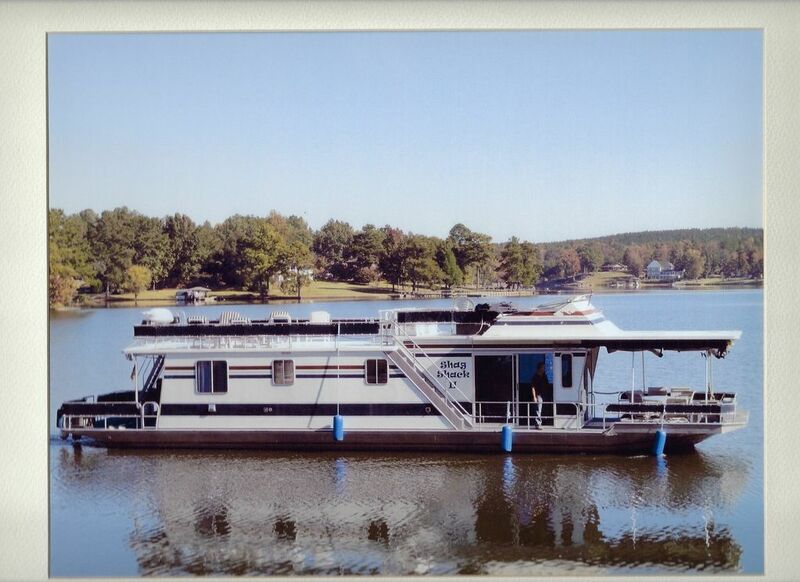 My wife's family has always had house boats on Lake Wateree. Her Grandfather had a house boat on Lake Wateree before there were ever any homes built on the Lake! This was shortly after the dam was constructed. Back then it was better know as "The River" and it is still called that by a lot of the local residents. Her father has also had several house boats over the years so it was only natural that we carry on the family tradition and own a house boat. Our first was named the Shag Shack, was 10 feet wide and forty feet long. Our family made some wonderful memories on that boat. As our family became larger, we out grew the Shag Shack. We went in search of a larger house boat and we now have the Shag Shack II which is 14 feet wide and 60 feet long. We have a home on Lake Wateree not far from the Shag Shack II and still enjoy taking the boat out occasionally. Bath and kitchen towels provided. Please bring beach towels for the lounge chairs or swimming activities. Please bring your own staple items. Pots, pans, glasses and silverware are provided. TV's in the salon and master state room. Dish Satellite service in the Salon, over air channels in the master state room. AM FM radio, cd player with aux input. Individual speaker selector for speakers located on the front deck, salon, master state room and upper deck. Salon and master state room. The Sail Club has a large grassy area for outside activities. there is a large lighted pavilion, two bathrooms, picnic tables, two charcoal grills and a nice swimming area near the boat ramp. Feel free to bring your boat and secure it to the Shag Shack II. Lake Wateree is great for all of your water sports activities. Front deck, rear deck, full upper deck with four lounge chairs plus additional seating. Guest may book the shelter for private events for 100.00 per day, ask for details. Loved every minute of our short getaway from the city! Everything for cooking and cleaning was provided and groceries were only a quick 15 minute drive away. We brought our own towels...but it wasn’t necessary. The views were spectacular and the quiet was much needed. Spacious and very inviting. Only thing we wished we had was wireless access for our Alexa devices/music. Next time (and there will be a next time) we will just bring a hotspot. Thank you so much, Robert. We will be back in the very near future! Second stay was even better than the first! We absolutely loved this unique rental when we stayed last year and jumped at the chance to book it again. It did not disappoint and the new sleeper sofa made the accommodations even more pleasurable! The host has thought of everything (well, except maybe another mirror for when three women are trying to get gussied up for the horse races!) The sunsets and sunrises are spectacular and the lake is charming and peaceful. 3473 Joh G Richards Rd. 3482 John G Richards Rd. The Renter and their guest agree to hold the Wateree Sailing and Boating Club and the owners of the Shag Shack II harmless for any accidents that may occur while on the Wateree Sailing and Boating Club premises or the Shag Shack II. Swimming is at your own risk, no diving is allowed form the from the Shag Shack II. Shelter rental is available for a 100.00 per day fee for your private event, details provided upon request. Wateree Boating and Sailing Club members retain access to the bathrooms and grounds at all times. A boat launch fee of 5.00 per stay is required if you wish to use the boat ramp. Execution of the rental agreement constitutes agreement of the rental terms listed above.